A chilly morning with a hint of fog outside and people wrapped tightly in blankets becomes a fresh winter morning only when a hot spicy cup of Adrak Tea is added to it. Well! That’s how important food is to Indians; especially a foodie city like Indore requires some better efforts to make every season ‘seasonal’. Every climate demands a different kind of palate on the menu but winter comes with a chilled surprise of hot spices. You may not be a big fan of cold weather but after tasting these listed winter special delicacies, we are pretty sure that Indori winter will become your favorite food season. Some of these dishes are exceptional treats for the foodie city and even others are best served here. While remembering your favorite food items, do not forget to mention the best ones in the comment section below! Even the famous cookbooks and Google itself proves that garadu is best made in Indori style. If you still haven’t tasted a hot spicy plate of Garad from streets of Indore, you are missing on one of the best things that can happen to you at just a price of 20 bucks. Garadu is a type of yam that looks a lot like sweet potato but tastes nothing like it. Being a root itself, people usually consider garadu to be of similar taste like potato or sweet potato but we assure you that once your taste buds know what garadu is, you won’t ever compare it to anything else. For Indoris, Garadu is the winter food from heaven and maybe that is why garadu isn’t available in every corner of the country. What adds jhannat feel to a plate of hot and crispy pieces of yam is again indori special, ‘Jeeravan’. In case this spice is new to you, Jeeravan is a miraculous blend of spices like cumin powder, dry ginger powder, red chilli powder, turmeric powder, black salt and rock salt. Preparing garadu in the kitchen is a bit tricky job and so you should leave it for professionals and focus on munching the spicy treat. Who said that winter treats can only be spicy, some sweet treats and their crazy mingles can remind you of how good life is. Hot and sweet gulab jamun with chilled vanilla ice cream is one such blend. The balance of hot and cold makes it a more exciting dish than it is individually. And this intermingling dish tastes best when the climate outside demands for more than just a sweater! So, with whom are you planning to share a spoon of this forever-love dish? 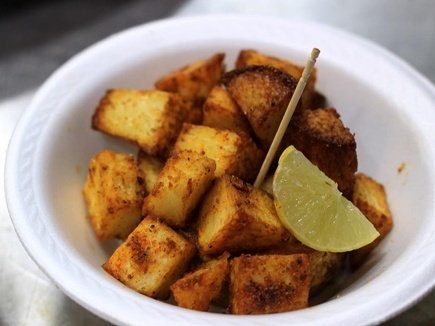 Moong ke pakode or bhajiye are the heartthrobs during the rainy season, but as the season changes to a chilly weather, a new celebrity emerges from the spicy land. Mirchi bhajja is one of the favorite dishes on the menu in winters. It is mouth-watering for those who are a die-hard fan of extra spicy and even for those who cannot resist a glass of water after a bite of chilli. The nutritional values of green chilli make this a plus for your health too. Though Mirchi bhajja is a spicy affair that began with southern cities it has definitely stolen the heart of many across the country. No winter can end without blowing of the steam from ‘too-hot to hold’ glass of kadhai doodh. And for Indoris, the one-stop destination is the very famous Chavani. Kadhai doodh is a sweet-hot delight prepared by stirring milk in a huge kadhai (pan) for a long time until rabdi or malai starts forming an irresistible layer on top. Now all left for you to do is ask bhaiya for a glass of milk with or without rabdi, as you prefer. Hold on! Kadhai Doodh comes along with some healthy chopped companions known as dry-fruits. They add the missing details you may need with your warm glass of milk. Remember those days when gajar ka halwa in Tiffin made you the most wanted among class? Well, that’s how magical gajar ka halwa is! The measurement of sweetness can vary but finding someone who doesn’t appreciate this appetizing dessert is very rare. Gajar ka halwa is best prepared in home kitchens but even the halwai (pastry chef) sitting behind your favorite sweet corner can do an outstanding job. 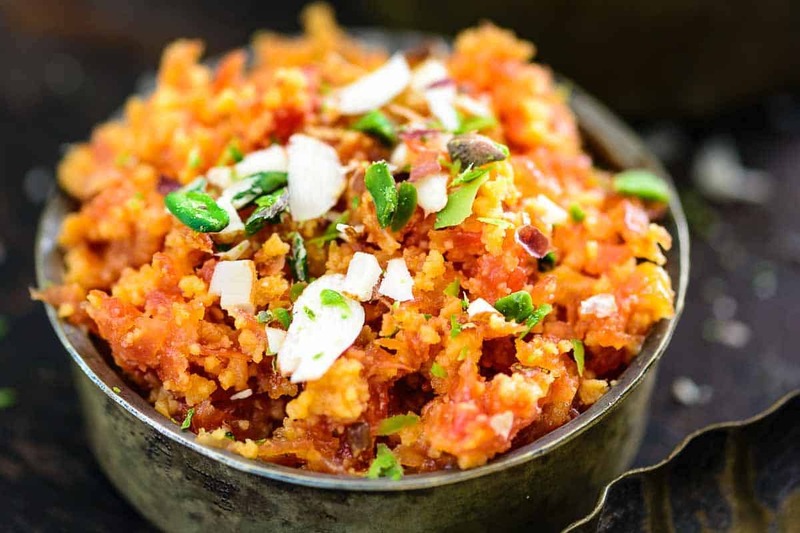 Gajar ka Halwa is an Indian dessert prepared with crushed carrots, milk and sugar or jaggery. Later chopped dry fruits are shredded on this sweetmeat. Winter is here, grab a spoon! Leaving the rest behind, gajak becomes the special appearance of this season with its fans on every corner of almost every street. Gajak does not come in a single character though, you will witness a wholesome of varieties in gajak on every store. Some of them are incredibly interesting like chocolate gajak, gajak roll and some that can astonish your eyes only with their texture and shape. Gajak is a dry sweet made of sesame seeds or peanuts and jaggery. As appealing as its taste is, the making of gajak can fascinate you in a second. What’s your favorite type of gajak? Every visit to sarafa has a few must-have items and malpua is definitely one of them. But this sweet course becomes a lot more interesting in winter. When hot malpua is served from the pan to your plate and you can observe the softness of malpua loaded with drops of sugar syrup, the scene itself is remarkable. You can enjoy malpua at anytime of the year but you should definitely treat your taste buds in winter. Talking about sarafa, Bhutte ka kees is one of the other names on the list. But again, prime time for this delicious item is between Novembers to February. Bhutte ka kees holds a special place for Indoris as it stays amongst the most favorite dishes continuing from rainy season till the end of winter. A hot plate of sweet-salty taste with a hint of tanginess added to it makes this dish a worth try for winters. Didn’t you feel the urge to grab a bite of these heavenly dishes as soon as you read their name? If yes, the wait is over. Streets of Indore are all ready to serve you pleasure in the form of these dishes. Though there is a dish, without mentioning which this menu cannot be completed and i.e. Makke Ki Roti aur Sarso da Saag. The only reason this list does not include it is that this ravishing Punjabi charm is best relished at homes. But every dish from the mentioned list is worth your try so, don’t miss any of them!